Win one of three Bio-Oil Skincare Oil hampers valued at R1 900 each. It’s no secret that pregnancy changes a woman’s body in almost every way possible – from the size of their breasts to the speed at which their hair grows. One change, however, that still takes many women by surprise is the drastic impact that pregnancy can have on their skin – the body’s largest and arguably most unsung organ. Bio-Oil has understood the pregnancy skincare concerns of expectant mothers for over 30 years, and knows that taking care of skin pre- and post-pregnancy can make a huge difference to a woman’s confidence as her body starts changing. To celebrate Pregnancy Education Month, Bio-Oil is giving away three Bio-Oil Skincare Oil hampers valued at R1 900 each. 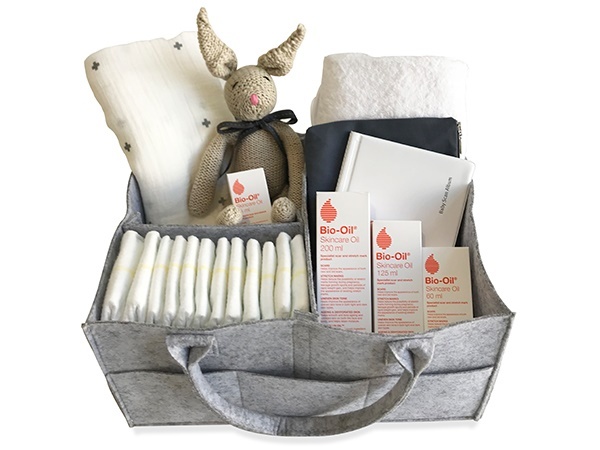 The handy nursery caddy includes a baby bath towel, a crocheted soft toy, an organic cotton muslin swaddle, a baby scan album, nappies, a grey pouch and four bottles of Bio-Oil Skincare Oil - the product most recommended by gynaecologists and midwives to help prevent pregnancy stretchmarks. Also read: Which four pregnancy skincare concerns does Bio-Oil Skincare Oil target and treat?